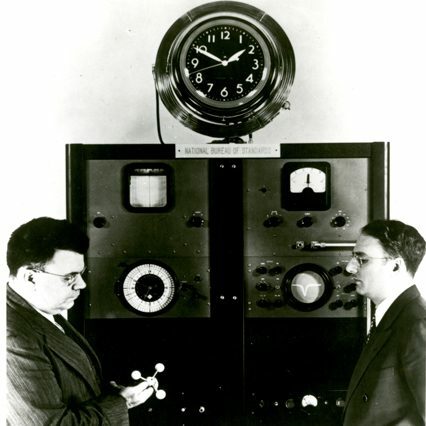 NIST Director Edward Condon (left) and clock inventor Harold Lyons contemplate the ammonia molecule upon which the clock was based. Time took on a new look and a new role at mid-century, and NIST, which maintains the nation's primary time standards, played a leading role in the transition. From the pendulum to the quartz clock, timekeeping had improved in the past. But NIST's operation of the first atomic clock in 1949 led to giant leaps in accuracy. Atomic clocks are based on the resonances, or vibrations, of atoms or molecules. (Some have called NIST's innovation a molecular clock, because it was based on resonances in the ammonia molecule, which contains four atoms. But the principle is the same.) NIST's achievements in this field later were cited as advancing the research of three 1989 Nobel Prize winners. The performance of the Institute's original clock was only slightly better than existing standards, but the precedent was set. Attention then shifted to the cesium atom, which by 1960 was incorporated into the world's official timekeeping system. Cesium clocks now keep time to an accuracy of about one second in 20 million years. These advances in performance of atomic clocks have supported the development of new technologies, such as high data rate telecommunications and the Global Positioning System. Accurate timekeeping will become even more important in the future as the speed of electronic systems increases, requiring commensurate improvements in levels of synchronization. Today, NIST's atomic clocks are used for many purposes, including the synchronization of Los Angeles traffic lights and guidance of deep space probes. The National Association of Securities Dealers requires that all electronic transactions be stamped with a time traceable to NIST. An Internet time service that allows users to synchronize their computers' internal clocks with NIST's atomic clock was receiving 30 million "hits" per day as of mid-2000, and the number was growing rapidly. NIST physicist Andrew Ludlow explains why it is important to have the very best measurement tools to measure and define physical quantities such as time. 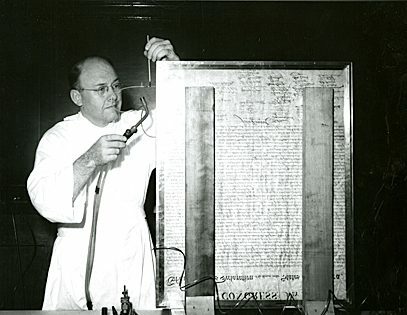 To guard against deterioration, the original parchment manuscripts of the Declaration of Independence, the Constitution, and the Bill of Rights were sealed using a preservation technique developed at NIST in cooperation with the Libbey-Owens-Ford Glass Company and Library of Congress. The helium-filled cases are still in use. Today, NIST is involved in a project with the National Archives to transfer the Charters of Freedom to argon-filled enclosures, allowing for the use of advanced measurement techniques to monitor conditions inside the glass. Testing of commodities purchased by the federal government, a very small part of NIST's work after World War II, led to one of the Institute's biggest controversies and some of the earliest debates on the role of science in public policy. Before the episode ended with the NIST's vindication in 1953, there were attacks on the Institute's technical work, investigations by two high-level committees, hearings before a U.S. Senate committee, debates over the definition of scientific truth, the forced resignation of Director Allen Astin (later reinstated) and a staff mutiny over it, and the resignation of an Assistant Secretary of Commerce. It all began innocently enough. As part of its long-term research on batteries, NIST tested batteries and additives for other units of the government. No additive was ever found to be beneficial. NIST did not ordinarily name commercial products, endorse them, or permit its tests to be used for advertising, but a series of events (including a request from a senator) converged to require tests of a battery additive marketed as AD-X2. The manufacturer claimed AD-X2 would improve lead-acid battery performance and, under some circumstances, revive a dead battery. NIST's laboratory tests found the product was not effective. But there were many satisfied users, and it was suggested that the government was persecuting a small manufacturer, which incidentally had some strong allies. For a time, these allies appeared to include the Massachusetts Institute of Technology, which ran its own tests. After many tense months, the controversy was finally resolved when a committee of the National Academy of Sciences—the nation's highest scientific authority—supported NIST's findings on AD-X2. Furthermore, the Academy found that the Institute's work on this case had advanced the science of electrochemistry by at least a decade. Through it all, NIST maintained its integrity in the face of intense public scrutiny. Nobody likes visiting the dentist, but it could be worse. For instance, getting a cavity fixed would take longer and be more uncomfortable if those drills were much slower, as they were in the 1940s before researchers at NIST made the prototype for today's high-speed drills. As part of an Institute collaboration with the American Dental Association (ADA), researchers developed the hydraulic turbine dental handpiece, which attained a speed of 61,000 revolutions per minute—almost 10 times that of a conventional drill—without vibrating or overheating. This 1953 invention inspired the later development of air turbines, which set the stage for even higher speeds. The hydraulic handpiece, which was given to the Smithsonian Institution in 1964, had an almost unimaginable benefit-to-cost ratio of 27,000 to 1, according to an estimate made in the 1960s. Not to mention happier patients. The drill was just one product of the collaboration with the ADA, which began in 1928 and continues today. In the 1940s, researchers found the first explanation of post-operative pain (delayed excessive expansion of dental amalgam), thus making it possible to eliminate the pain. 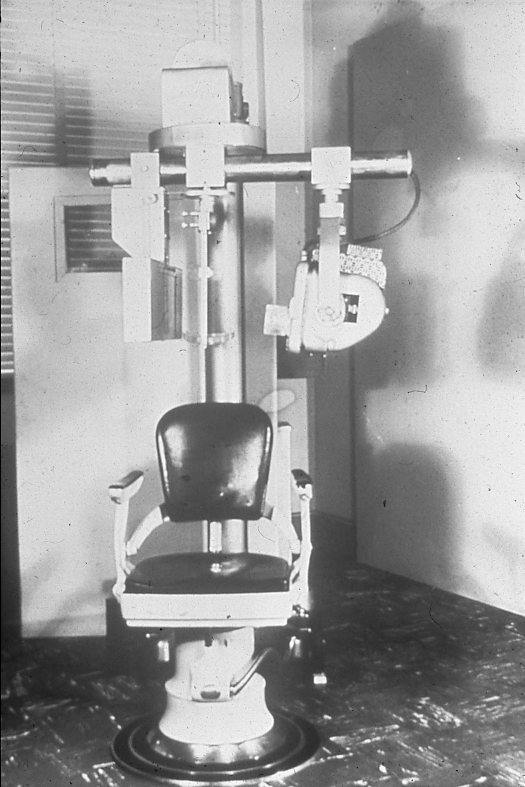 In the 1950s, the team developed a panoramic X-ray machine (see photo above), which made it possible to take a picture of the whole mouth with only one exposure, significantly reducing the radiation doses to oral tissues. It remains in use today by the military and many dentists. And the development of composite filling materials and dental adhesives has been important both aesthetically and economically. Tinkertoy meant a lot more than child's play at NIST in 1953, when a project named after the toy construction sets mechanized the production of modular electronics, a step toward the ubiquitous microelectronics of today. Project Tinkertoy was intended to help ensure national preparedness in emergencies by drastically reducing production lead time and enabling rapid conversions from civilian to military products. The Navy selected NIST to lead the project because it offered the "most advanced state of processed circuitry." The Institute already had developed a modular design concept and engaged in pioneering work in printed electronic circuits. Dubbed the outstanding development of 1953 by the journal of the Society of Manufacturing Engineers, the Tinkertoy process was used to make sonar buoys for detecting enemy submarines. The project also contributed to the development of the first metal-ceramic vacuum tubes. But the fabrication equipment was complex, and the concept was quickly supplanted by transistors and printed circuit boards, to which some of the individual Tinkertoy components were applied. 1954: Profitable Ideas—The First "Reading Machine"
Jacob Rabinow could turn just about any idea into a functional piece of equipment. So it was with his reading machine, one of about 230 inventions patented by the NIST engineer and the forerunner of the optical scanners used by banks and post offices today. Cited as his best-known invention by the Lemelson-MIT Prize program, which honored Rabinow in 1998 for his lifetime achievements, the original reading machine is on permanent display at the Smithsonian Institution. Video highlights late NIST engineer/inventor Jacob Rabinow and his extraordinary achievements. His legacy lives on through NIST's Jacob Rabinow Applied Research Award granted annually. Rabinow got the idea for machine reading, or "optical character recognition," when a friend went blind in the late 1930s. Later, he convinced his boss at NIST to let him build a reading machine. The resulting machine read the alphanumeric output of a portable typewriter, pioneering the "best match" approach by comparing each character on a printout to the entire alphabet and determining which letter was most similar. "It enabled us to read very poor printing that could not be read by any other means," Rabinow said. The machine read one character per minute—to the cheering of onlookers. By comparison, today's machines can recognize up to 10,000 characters per second. The reading machine is just one of many novel technologies nurtured by NIST, which long has encouraged innovation by industry and the public as well as its own staff. NIST took on an official role in encouraging private-sector innovation in 1940, when it was assigned to support the National Inventors Council (NIC), formed by the Secretary of Commerce to promote defense-oriented invention. NIST performed evaluations through 1964. 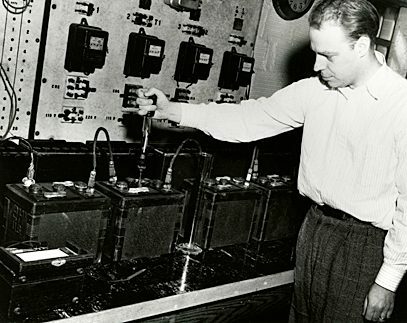 During those years, more than 340,000 ideas were evaluated by the NIC, and many were referred to defense agencies for support; the mercury battery for "walkie-talkies" was a notable result. From 1964 through 1974 NIST provided an information and referral service for inventors. Legislative action in 1975 again assigned the Institute a similar official role, this time in encouraging energy-related invention. From 1975 through 1998 under the Energy-Related Inventions Program, NIST solicited and evaluated more than 32,000 ideas, recommending more than 700 for U.S. Department of Energy support. By 1998, NIST-recommended inventions reaching the marketplace had generated more than $1 billion in sales and saved sufficient energy to light 10 million homes for a year. 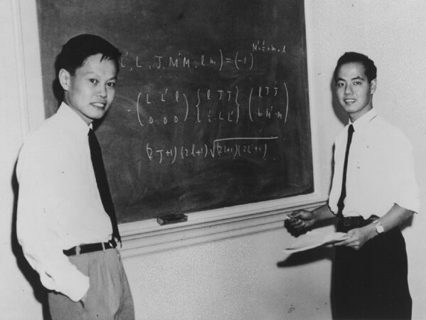 Physicists Chen Ning Yang (left) and Tsung Dao Lee at the Institute for Advanced Study in Princeton, N.J. The rules of physics were rewritten when a difficult experiment at NIST showed, strikingly and convincingly, that in at least one fundamental physical process, the world is distinguishable from its mirror image. Physicists long had assumed the opposite, constructing their theories so that the corresponding mathematical property, parity, remained unaltered in all subatomic processes. Thus, this experiment brought about "the fall of parity" from the ranks of well-conserved physical quantities such as energy and momentum. The results verified theoretical work in quantum mechanics that won physicists at Princeton and Columbia universities the Nobel Prize in physics. The experiment at NIST was conducted by (pictured, left to right) Ralph Hudson, Ernest Ambler, Dale Hoppes, Raymond Hayward, and (not pictured) Chien-Shiung Wu of Columbia University. Humming along at 1 megahertz and offering 6,000 bytes of storage, NIST's Standards Eastern Automatic Computer (SEAC) was a marvel at the dawn of the computer era, introducing many "firsts" and demonstrating early applications of the technology that defined the late 20th century. 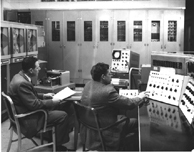 Dedicated in 1950, SEAC was the first operational, internally programmed digital computer in the United States. It served the government for more than 13 years, handling tasks such as Air Force planning, Social Security accounting, and checking of calculations for the design of the hydrogen bomb. Its engineering innovations included electric typewriters and retooled teletype machines as input-output mechanisms, new memory mechanisms using ultrasonic technology, and a graphical display that produced the first computerized image in 1957. To input that image, NIST researchers built the first scanner, a simple rotating drum to trace variations in intensity over the surfaces of photographs. When a 5 centimeter (2 inch) square picture of NIST engineer Russell Kirsch's son was scanned into SEAC, it launched the field of image processing, which today has applications ranging from satellite imaging to desktop publishing. Kirsch also demonstrated early artificial intelligence and timesharing applications and wrote the first "picture grammar" (programming rules for combining pieces of a picture to form a complete image). Much of what is known about the universe has been learned through spectroscopy, a technique for identifying and characterizing the substances present in stars and other objects based on the characteristics of the emitted light, which depend on the energy levels of the atoms. And much of what is known about spectroscopy can be attributed to NIST. Among its greatest contributions is Atomic Energy Levels, three volumes published between 1949 and 1958, which are still considered models of authenticated, verified, consistent data. Earlier compilations were incomplete and inadequate for many applications. NIST's highly reliable data had a swift impact on, for example, the development of gas lasers. Arthur Schawlow, who with Charles Townes wrote the 1958 paper that launched the laser field, credited the data with assisting the pair in their early selection of materials that could lase. "The [NIST] tables have been, and are continuing to be, essential tools in the search for new laser materials and new wavelengths," Schawlow wrote in 1971. (Both men won Nobel Prizes for other scientific achievements.) In all, the NIST volumes have been cited by others about 13,000 times, more than enough to be considered "citation classics." The data were compiled by Charlotte Moore, one of few professional women at NIST in those days, with great persistence, initiative, and attention to detail. Under the direction of William F. Meggers, she gathered published and unpublished data from many sources and, when data were missing, located the appropriate experts and asked them for help. Her work served as a model for NIST's more recent atomic data compilations, which have included a fourth volume of energy levels for the rare-earth elements published in 1978. A NIST research team invented the diamond-anvil apparatus, which can compress samples to ultrahigh pressures. The designers used single-crystal diamonds (confiscated by the U.S. Customs Service) as the compressing surfaces because of their great hardness and transparency to light. Similar devices, together with a technique developed at NIST for measuring pressures inside the sample chamber, are used today by scientists worldwide. Applications include studies of the effects of pressure on solids, liquids, and gases using a wide variety of scientific measurement techniques. After he retired, former NIST Director Lyman Briggs used a wind tunnel he designed in 1918 and the pitching staff of the Washington Senators to settle a long-disputed question: the degree to which a baseball can be made to curve in the 18 meter (60 foot) throw from the pitcher's box to the plate. He found that the spin rather than the speed of the ball determined its break. Briggs described his research-widely reported in the news media-as a logical development in the field of mechanics and closely related to NIST work in ballistics and projectiles.